The residency is based in converted stable buildings, part of Highgreen Estate, set in the sparsely-populated hill-farming area of Tarset in the North Tyne. Highgreen is remote with stunning views across the moors. There is an immediate community of about 15 people and the hamlet of Greenhaugh with an inn is about three miles away with the village hall at Lanehead about a mile beyond that. See https://www.tarset.co.uk/ for more about the area and this vibrant rural community. The local shops are in Bellingham, some 8 miles away and Newcastle is 40 miles away so the artist will need to have his/her own transport. Highgreen is made up of a collection of 18th Century buildings. Whilst the studio and site is generally on ground level with no steps, the buildings have access limitations. The artist’s flat is in part of a restored stable block and is accessed via a steep flight of stairs. We realise this isn’t ideal and makes the residency unsuitable for artists who use wheelchairs or find stairs difficult to manage. You can see photos of the studio and living accommodation here. The total package, including free studio and living accommodation with broadband and utility bills paid, is worth £20,000. £7,200 fee is paid to the artist. The artist is responsible for their own personal costs eg materials, transport, food, access needs etc. The residency is supported by VARC staff and an appropriate mentor who will be able to visit the artist twice during the residency if it’s felt the artist will benefit from this. There will be an exhibition at the end of the residency that VARC staff will support. VARC will pay for presentation and refreshment costs and promote the event. VARC will produce an artist’s catalogue, 30 copies of which will be given to the artist. · a history of exhibiting work and undertaking arts projects or residencies. · The artist will live and work for the period at Highgreen. · The artist will spend 20 days during the residency preparing and delivering an engagement programme with the public and with community groups (planned by VARC staff in consultation with the artist). This could include work with young people with special needs. · The artist will produce a body of work for an end of residency exhibition held at Highgreen. · The artist will feed into an evaluation process. The deadline for applications is 16th April. Interviews of shortlisted artists will be held by skype or face to face as appropriate. These will take place in May. Visual Arts in Rural Communities is a registered charity who has been running an artist residency programme for the past 17 years. 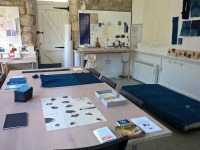 See https://varc.org.uk/residency/ for more about VARC and artists who have held residencies with us. A visit to Highgreen is possible. In the first instance please ensure you are eligible then message the curator to arrange a visit at a mutually convenient time and date. The curator works Mon-Wed each week and won't be able to respond outside these days. Artists from all backgrounds and diversity with a track record of exhibiting or undertaking arts projects and/or residencies. Students aren't eligible. 10 images uploaded and links to videos and website. Please provide details of images as a separate uploaded document. The artist pays VARC nothing but needs to cover his/her own personal expenses; travel food and any personal costs. Yes, there is £7,200 fee to the artist. There are travel expenses paid to cover petrol costs in travelling to deliver workshops that are part of the organised engagement programme. There will be an exhibition weekend at the end of the residency period, promoted by VARC and with refreshments provided. Whist the site as a whole and the studio is on ground level the studio and accommodated is based in converted 18th Century buildings and has access limitations. Doors are old and the artist's flat is in part of a restored stable block and is accessed via a steep flight of stairs. We realise this isn't ideal and makes the residency unsuitable for artists who use wheelchairs or find stairs difficult to manage. VARC will promote the artist and his/her work during the residency via social media posts and other occasional print and electronic updates. The exhibition will be promoted to members of the public and to the media. Yes, the artist is expected to live on site.